Two soon-to-be-married Christian camp counselors reported missing earlier this week were murdered in their sleeping bags on a Sonoma County beach, authorities said. Their autopsies were being performed Friday. The bodies of Lindsay Cutshall, 23, of Ohio, and Jason Allen, 26, of Michigan, were discovered by chance Wednesday on remote Fish Head Beach, when deputies rescuing a stranded hiker spotted the crime scene from their helicopter. "They were shot in the head, presumably in their sleep because there was no disturbance at their camp site," Sonoma Sheriff's Lt. Dave Edmonds said. "It appears to be a terrible crime absent of motive, which is a concern to us." There were no signs of sexual assault or robbery, and the possibility of a murder-suicide was ruled out because no weapon was found at the scene, authorities said. "From all indications, the victims were very upstanding citizens, they were very honorable people. They had an absolute absence of enemies," Edmonds said. Police believe the couple arrived last Saturday in the Jenner area, about 60 miles north of San Francisco, and apparently were camping overnight on the beach. 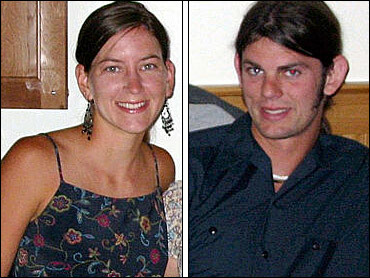 They were supposed to return to their Christian outdoor adventure camp in the Sierras on Sunday. Their bodies were spotted by a helicopter crew sent to rescue a 17-year-old boy who had fallen about 50 feet down the cliff while trying to retrieve a purse dropped by his girlfriend. The dead couple's red 1993 Ford Tempo was found near the scene, parked on Highway 1, more than 200 feet above the beach, which is about three miles north of Jenner. The vehicle, which has a kayak rack and Ohio license plates, was impounded as evidence. The car was locked, and the keys were found. Their bodies were found fully clothed, side by side in sleeping bags near their belongings, which included a Christian book, wedding literature, camping gear and backpacks. More than 20 detectives, including the Sonoma County Violent Crimes Unit, spent the day processing the scene, reports Kurtis Ming of CBS affiliate KOVR in Sacramento. Cutshall and Allen were missionaries who were spending the summer as whitewater rafting guides at Rock-N-Water, a Christian adventure camp in Coloma, in the Sierra foothills about 40 miles east of Sacramento. "Jason and Lindsay were two incredible people that loved God, his creations, and loved to share them with youth," camp leaders said in a statement. Records show Cutshall used a credit card to buy miniature Tabasco sauce bottles on Pier 47 in San Francisco at 1 p.m. Saturday, said Lt. Kevin House, spokesman for the El Dorado County Sheriff's Department. They were reported missing to the El Dorado County Sheriff's Department on Monday after they didn't return to camp. They were last seen around 8 p.m. Friday, when they said they were going to visit friends and said they would return on Sunday. "It was just completely out of character for them," House said. "They were always reliable and always conscientious in showing up to work on time." Cutshall's parents came to California from Ohio and Allen's parents arrived from Michigan after their children were reported missing. Several newspapers reported details of the couple's background and relationship. The couple were both experienced whitewater guides who met at Appalachian Bible College in Bradley, W. Va., where Allen, a native of Zeeland, Mich., majored in camping. "He was just a good kid," said David Boss, a neighbor of Allen. "They're very good people." Cutshall grew up in Fresno, Ohio — an unincorporated village of about 300 residents about 80 miles south of Cleveland. After college, Allen had moved to a nearby farmhouse to be close to her. Cutshall's father has been the pastor of the evangelical Fresno Bible Church for nearly 20 years and had planned to preside over their marriage ceremony next month. Cutshall was supposed to return to Fresno this Sunday to help prepare for the wedding. The couple also had planned to honeymoon in Costa Rica before moving to West Virginia for the fall river season. Word of their disappearance — and the subsequent confirmation of their deaths — spread quickly in her small town as families called one another to break the news. Her parents later released a statement, saying in part, "They are a gift of God that will forever bless our lives."